In my traveling experience, most small towns that have a Farmer’s Market are places worth visiting. It demonstrates that the community understands the value of promoting the bounty of the region and the economic benefits of shopping locally. 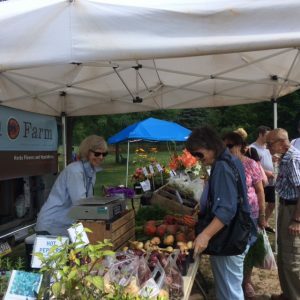 Kudos to Wanda Eisenhauer and Susie George, the leaders of the Hawley Farmer’s Market, along with the more than 20 farmers and six producers who have made the commitment to be there every week. The Hawley Farmer’s Market is in the coolest location in town – at Bingham Park, right next to the town icon, a 1920’s bandstand. It is also next to a really great kids playground. You can buy ice cream from Creamworks, where they make ice cream from their own cows. Then, send the kids off to climb and swing while you shop. On a recent trip to the market, I had a list of products needed to complete a menu for a dinner party. I was amazed at how much I was able to purchase there from cilantro to beets and tomatoes and blueberries. There are at least four produce vendors and shockingly they do not mimic each other’s wares. Not to mention the bread from Myrtle Avenue Bakery – oh wow! This is truly an artisan bakery with an amazing variety of bread and baked goods. Quails are Us provides eggs and meats of superior quality. There are products from the fields and woods – oh, the mushrooms! And soaps with scents, and other high-quality vendors in wood. The place is packed – every Friday in season from 2:00 – 5:30 PM. If you haven’t been there you need to go. Learn more about the Hawley Farmer’s Market on their dedicated Facebook page. Or, to learn more about member events and things to enjoy in Hawley, PA visit our events page. Congrats Hawley, you are a super little town with a great Farmer’s Market!